Tonight at Te Wharewaka in Wellington, the New Zealand Festival, in partnership with A Waka Odyssey Creative Team, and Te Āti Awa / Taranaki Whānui Iwi, announced the 2018 Festival will open on 23 February with a stunning Waka spectacular. 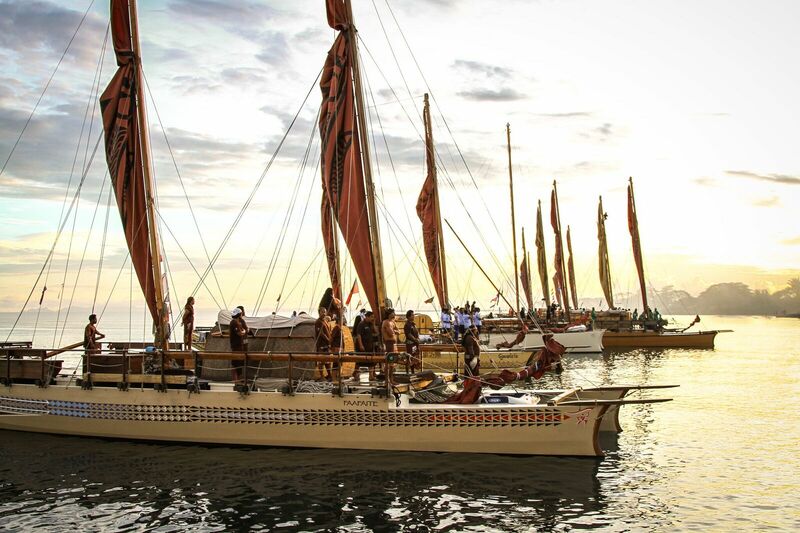 Designed to honour and celebrate our shared voyaging history, A Waka Odyssey is a series of events over five days, beginning with an opening night theatrical spectacle to honour the legacy of famous Pacific explorer, Kupe. The choreographed movements of seven waka hourua, eight waka taua, and a fleet of waka ama will bring the harbour to life; while on land actors, choirs and kapa haka groups welcome the voyagers to the Capital. A 1000-strong new haka for Wellington will be performed, and a full musical score is being composed by New Zealand music icon Warren Maxwell. The Festival is showcasing A Waka Odyssey with the three talented Creative Directors behind the work: the master navigator, scholar, and Haunui captain HoturoaBarclay-Kerr, the award-winning director Anna Marbrook, and international artist and designer Kasia Pol. A Waka Odyssey is supported by Wellington Regional Amenities Fund. For generations, African men have gathered in barber shops. Sometimes they have haircuts, sometimes they listen, more often than not, they talk. Barber shops are confession boxes, political platforms, preacher pulpits and football pitches... places to go for unofficial advice, and to keep in touch with the world. Barber Shop Chronicles is a heart-warming play set in barber shops traversing Johannesburg, Harare, Kampala, Lagos, Accra and London. Jordi Savall, with Hespèrion XXI & Tembembe Ensamble ContinuoIn Folias Antiguas y Criollas at the Michael Fowler Centre on 24 February, Jordi Savall and his renowned early music ensemble Hespèrion XXI will be joined by South American/Mexican chamber music group Tembembe Ensamble Continuo for an evening of world music taken from a number of Savall's recordings, juxtaposing European Baroque music with songs and dances from indigenous South America. Held every two years across February and March, the New Zealand Festival is New Zealand’s largest celebration of cutting edge culture. With more than 30 years’ experience producing successful Festivals, our longevity and reputation mean we continue to attract the world’s greatest cultural performers to the capital. We also support the growth of New Zealand artists to showcase new work both here and internationally. As well as bringing the best in music, arts, literature, dance and theatre to Wellington, we are known for presenting successful large-scale ticketed events such as the Royal Edinburgh Military Tattoo(2016). Under the Artistic Direction of Shelagh Magadza the Festival has committed to presenting and producing large scale, free, participatory community events, such as The Big Bang (2014) and Le Grand Continental (2016). The next New Zealand Festival is 23 February – 18 March 2018. The full programme will be released on 17 October. Find out more at www.festival.co.nz.